There’s no reason to live with crooked teeth when John A. Carollo, DMD, of Florham Park, NJ can straighten your smile for you in a practically seamless way with the help of Invisalign. 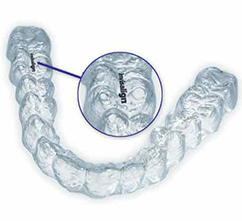 An alternative to metal braces, Invisalign is an orthodontic option that features a series of clear, customized aligners that are worn in a sequence and can be easily removed if needed. They’re designed to gently straighten crooked or rotated teeth so that you can achieve a beautiful, new look without having to rely on unsightly metal braces or bands. Dr. Carollo offers a free Invisalign consultation for patients interested in the procedure! Please contact our office today to schedule an appointment. During this time, you’ll engage in one-on-one conversation with Dr. Carollo where you’ll discuss your specific dental and orthodontic needs. Our office manager will also discuss the fees involved and let you know if your dental insurance will cover the procedure. With the use of 3D graphics and clinical photographs, we can even show you several clinical cases that are similar to yours so that you can have a more complete idea of what your smile will look like following treatment! Like its name implies, Invisalign aligners are practically invisible, so you won’t need to worry about what your friends and coworkers are thinking about your dental work. Instead, they’ll only notice the beautiful results that follow. The aligners are removable, meaning that you won’t need to make any inconvenient changes to your diet or oral health care routine in order to accommodate them. If you have a big event coming up where you’d like to look your very best, it’s even all right to remove the aligner for a few hours so that you can enjoy the night to the fullest. Just remember to put it back on once you’re finished! In most cases, Invisalign treatment is completed in less than a year, which is a significantly shorter time than traditional braces usually require. Contact our Florham Park, NJ office today if you have any questions about Invisalign, or if you’re ready to schedule an appointment with Dr. Carollo. We love helping patients achieve smiles that are both healthy and beautiful. Misaligned or crooked teeth are a common problem in the dental world. Not only can they hurt one’s self-confidence, but they can actually cause oral health problems in some cases if left uncorrected. 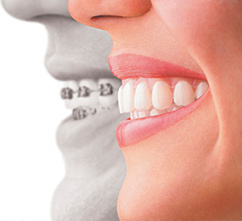 Traditional braces can help patients of all ages achieve smiles that are straight, beautiful, and healthy. With the help of precisely placed wires and brackets, your new braces will place constant pressure on your teeth, slowly moving them into their proper position. You’ll be amazed by how transformative your results can be! We also offer Invisalign and other clear braces options for patients who prefer a less noticeable solution.